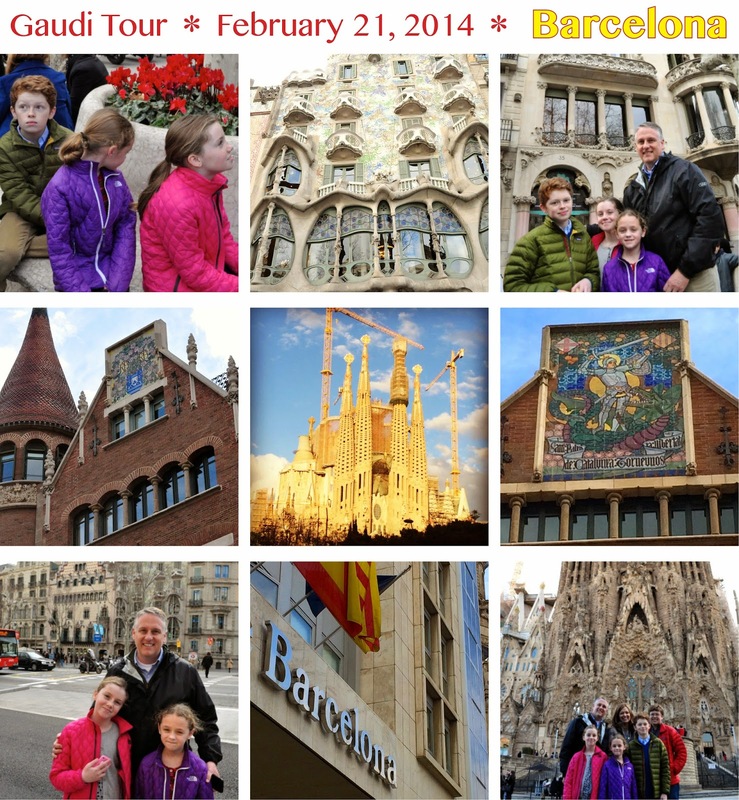 We left Fitou early on Friday the 28th of February, headed for another weekend in Barcelona. 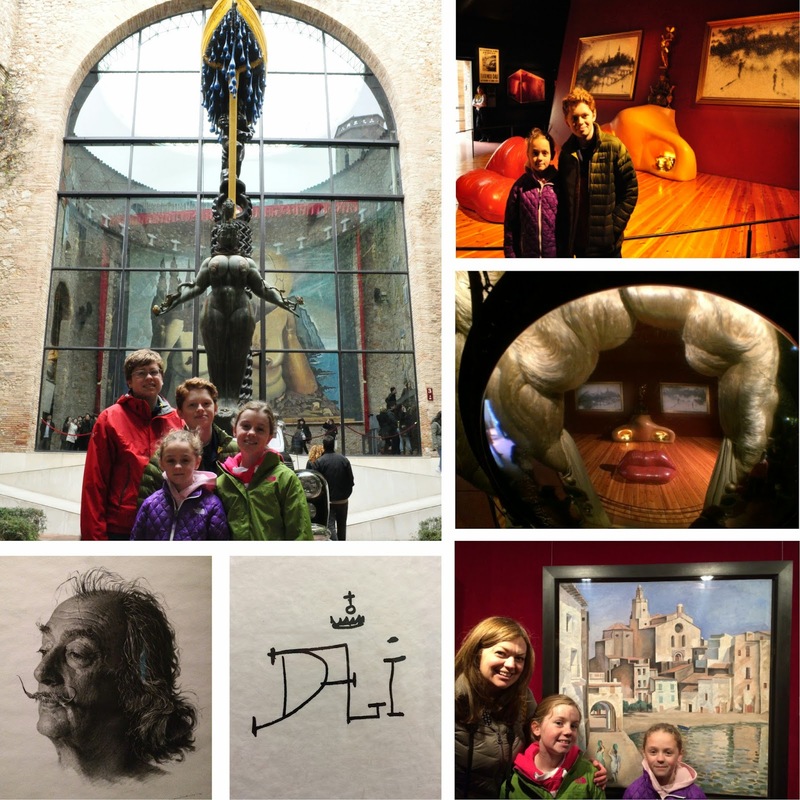 We stopped at the Dali Museum in Figueres on our way. It was easily the funkiest thing we saw during our seven months in Europe. Bizarre. When asked what he was taking, Dali said, "I don't do drugs. I am drugs." Pretty much sums it up. One of the reasons for picking Fitou, in south-western France, was it's proximity to Spain. 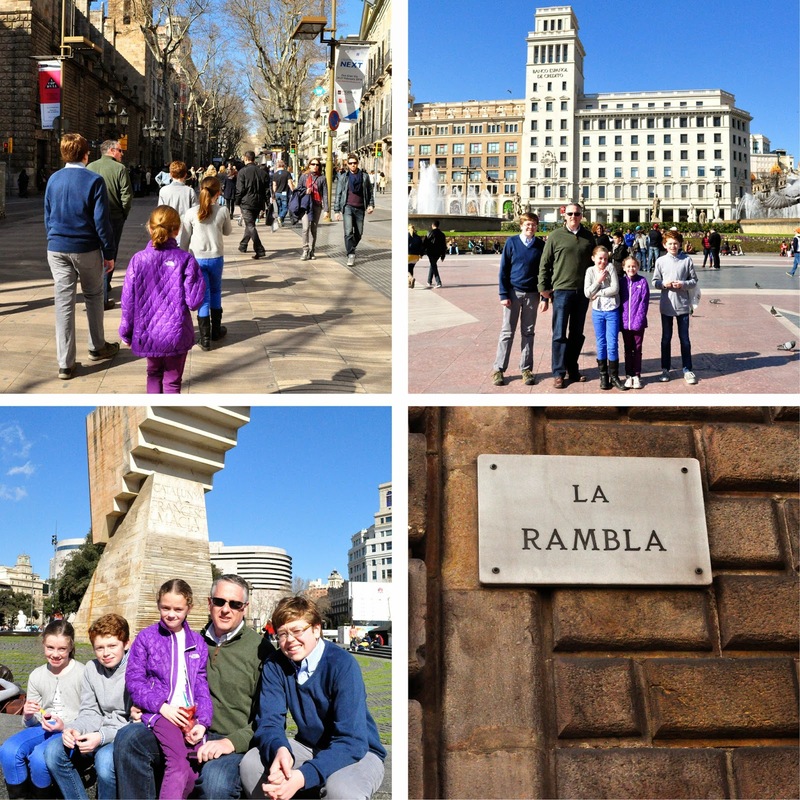 Barcelona was only a two-and-a-half hour drive away. 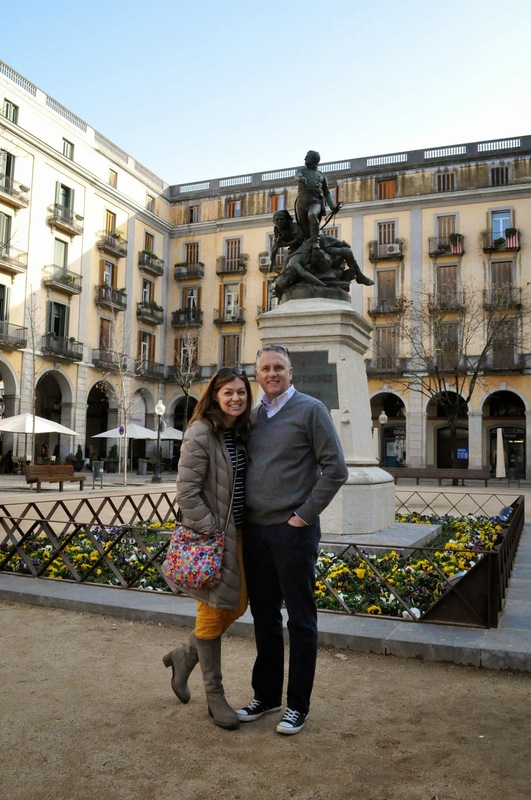 We left early the morning of Friday, February 21st, and made it there in time to check into our hotel and catch the Sandeman's free three hour walking tour at 11:00 a.m. It was fantastic. 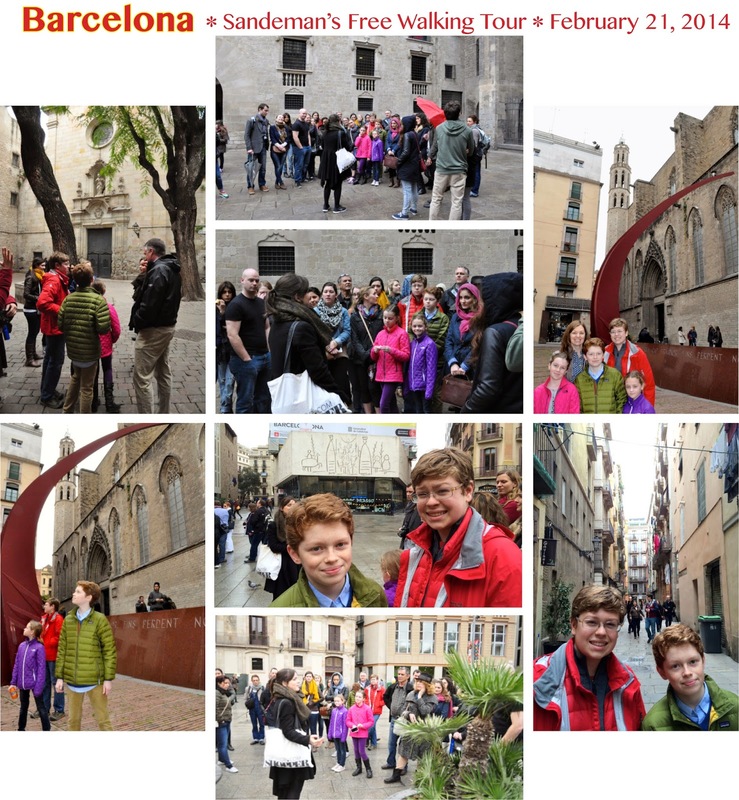 We really liked our guide, Helen from Edinburgh, and we loved walking through the Gothic quarter, seeing the Cathedral, the Roman ruins, and learning about Catalan history and legends. The boys all enjoyed Enrique Tomas, where they got Parma ham sandwiches. The girls opted for bakery sandwiches and/or pastries. 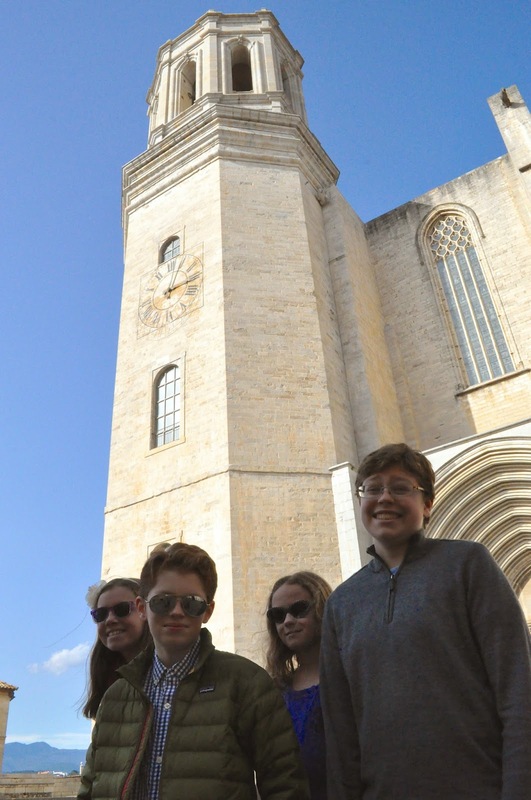 We liked the morning's tour so much that we signed up for Helen's afternoon tour, focused on Gaudi, at 2:00 p.m. 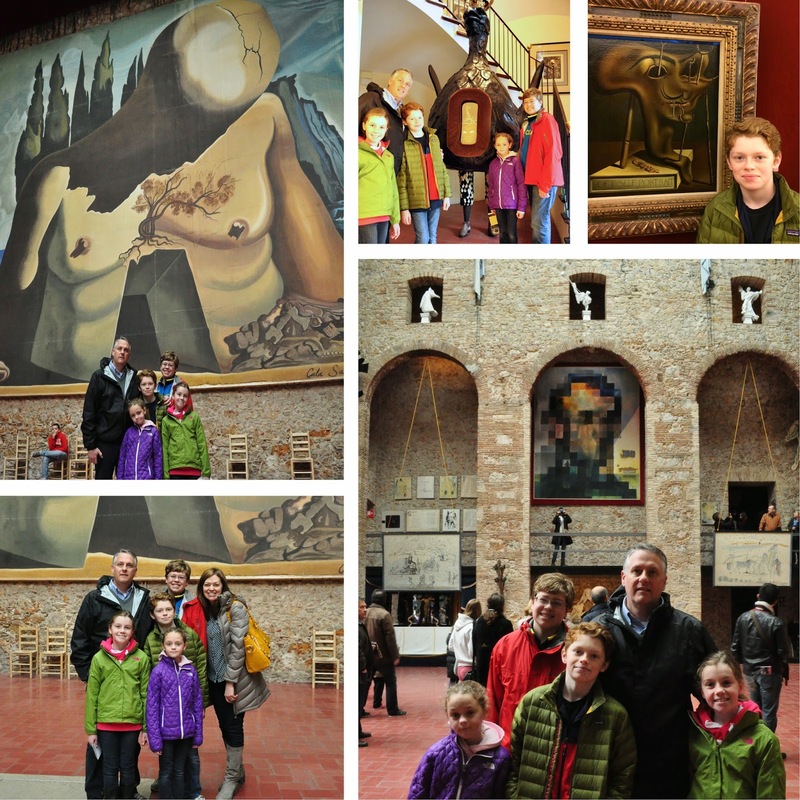 The kids were troopers—we spent almost another three hours on that tour. It only ended up being 7+ miles, but they totally kept up with the walking and learned a lot too. A bonus for the day was finding Waldo! Rob couldn't resist sneaking a photo of him on the subway. :) Another bonus was meeting a Westie with a nice owner. These kids miss their dog! We ate dinner in an Italian restaurant near our hotel...Rob was the only one feeling adventurous enough to go for tapas or paella, and this place seemed family-friendly, unlike many of the tapas bars. 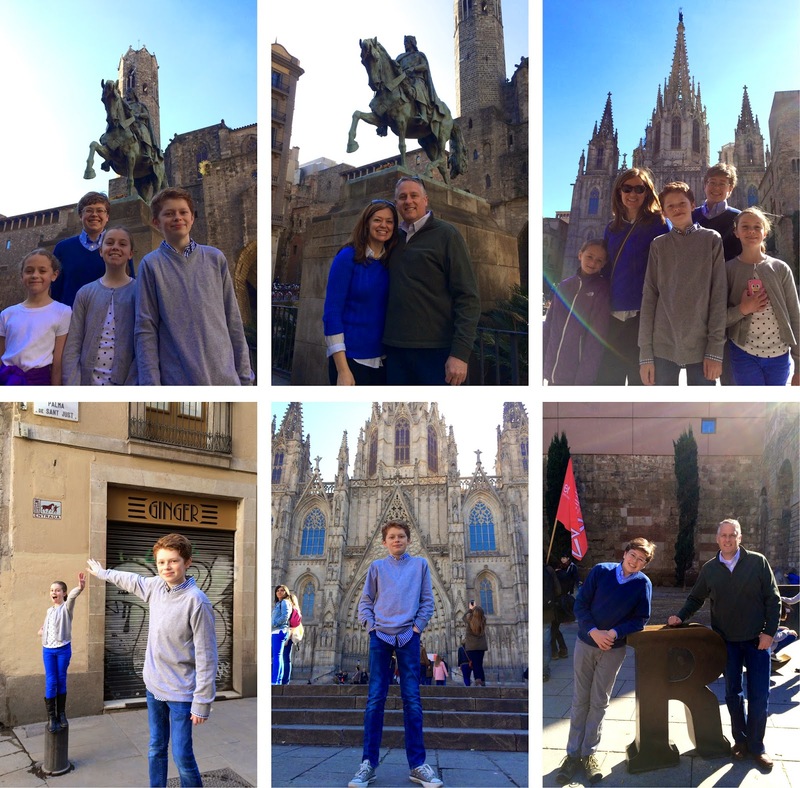 We loved our Hotel, Hotel Hispanos 7 Suiza, a short walk from La Sagrada Familia. The next morning (our 18th anniversary!) 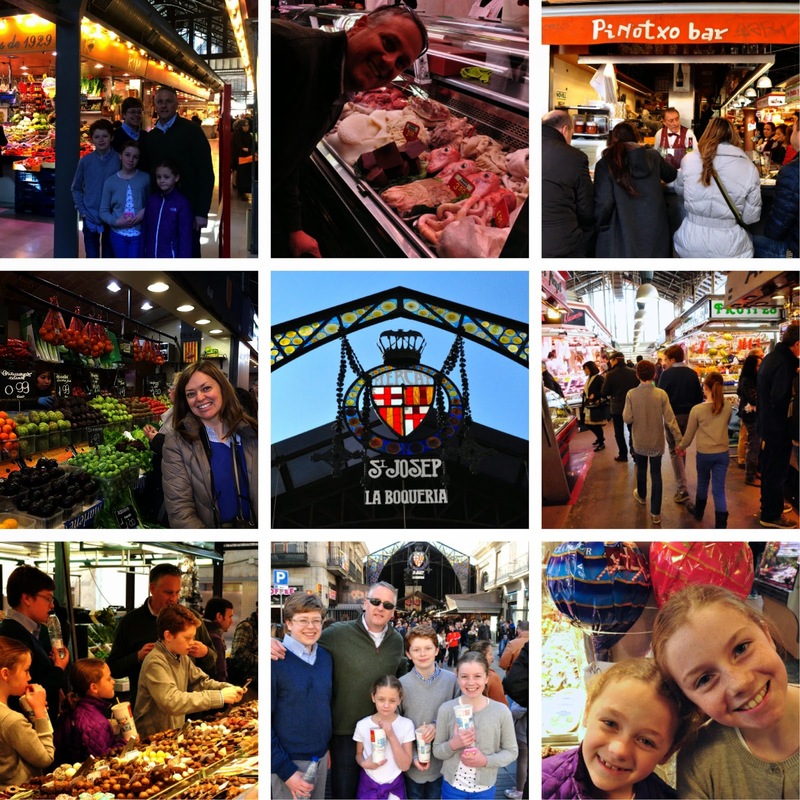 we headed for the St. Joseph's market for breakfast—freshly squeezed juice and fruit. Looking back, after six months in Europe, we all agree that the fresh mango there was one of the best things we've eaten on this trip (well, except Ellie, who doesn't like fruit!!) There were quite a few things we don't often see at grocery stores in the U.S.—tripe, whole animals, various intestines and brains. 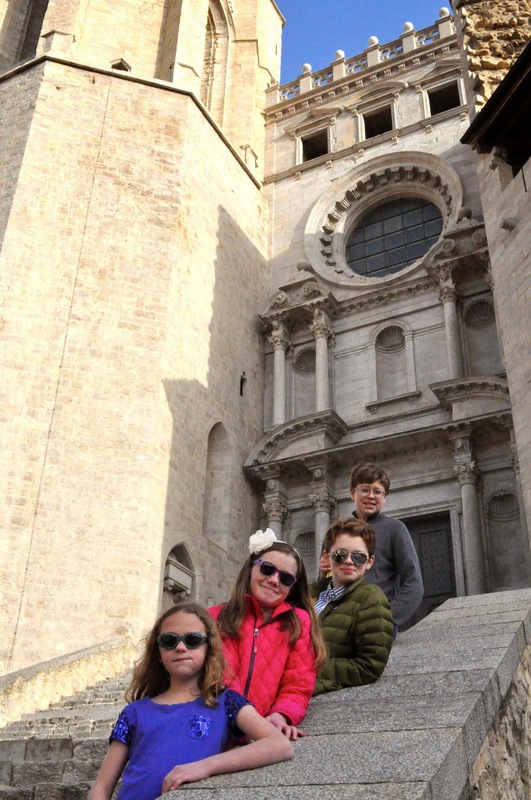 We made our way back to the Gothic Quarter to go inside the Cathedral. We had to sample the hot chocolate our guide had recommended, and went all out with churros and crepes too. 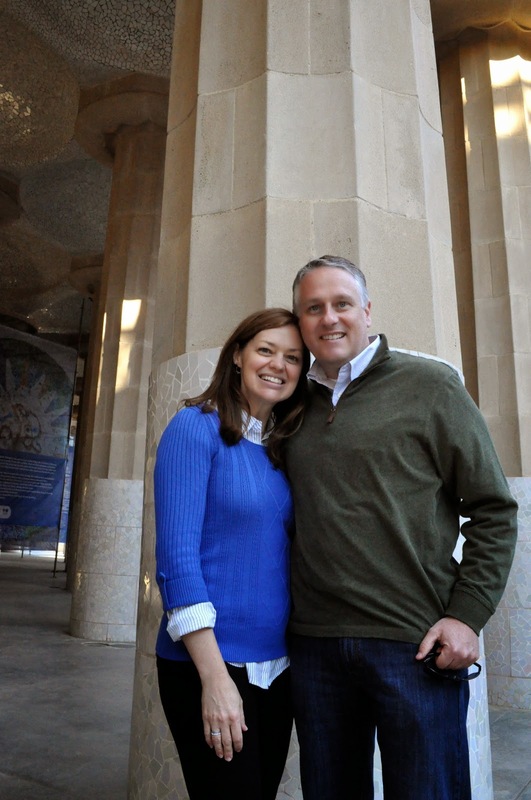 We decided that we could easily make Barcelona an anniversary tradition. Great place to go in February, it was beautiful weather! I'm going back to backdating all posts to the date they happened rather than the date we got around to blogging about it, because I really want to record our recent adventures, but still keep things chronological. Kind of OCD that way. One of the reasons for picking Fitou as our base in Southern France was the proximity to Spain, where I served my mission. 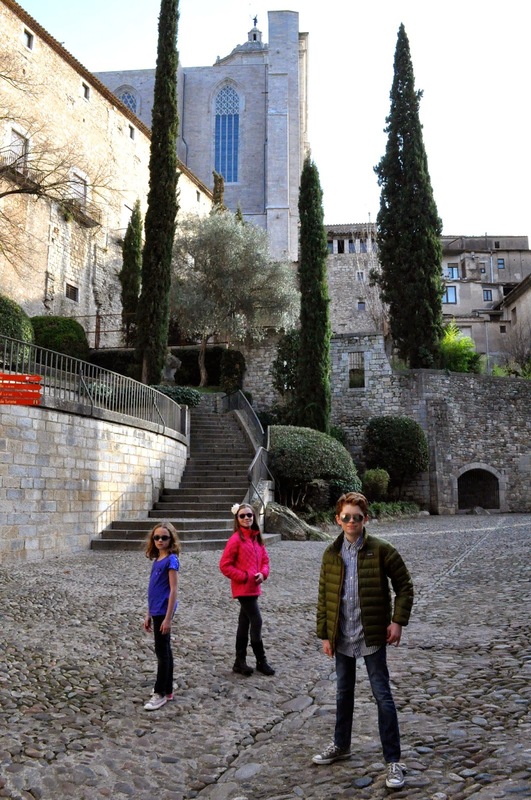 On Monday, February 17th, we drove 90 minutes to Girona and spent the day. But then it is immediately clear that you are actually visiting Catalunya. All the signs are dual language, but the one you hear spoken the most seems to be Catalan. And the Catalunyan flag is everywhere. It was a gorgeous day, and such a beautiful city. Plenty of opportunity to sport the cool shades. I did make them take them off for at least one photo. On a bridge by Gustave Eiffel. We made it back to Perpignan in time to take the missionaries to dinner. We found a good Italian restaurant and treated Elders Cueva and Hilburn and Sisters Packard and Jackson. It was great to get to know them during our month here. 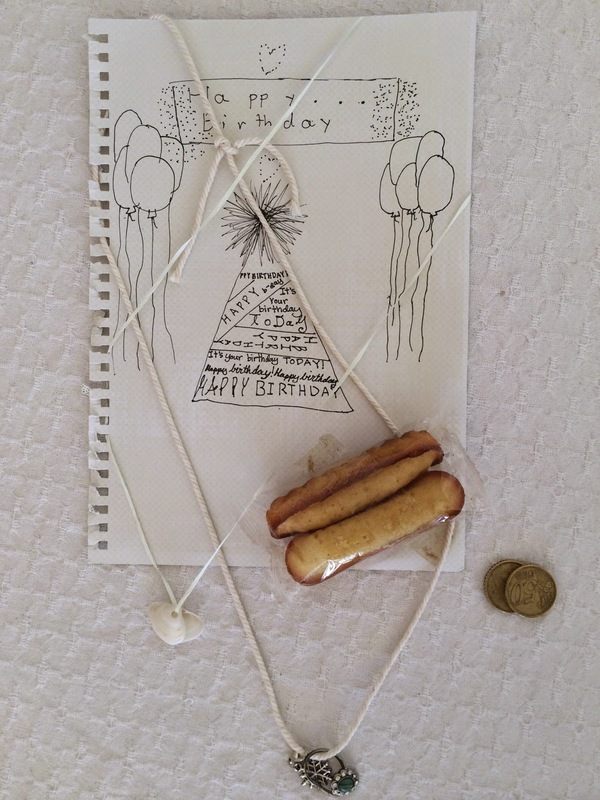 Belated guest post for February 13th and 14th, 2014. Actually posted on June 17, 2014. Hello, my name is Ainsley. 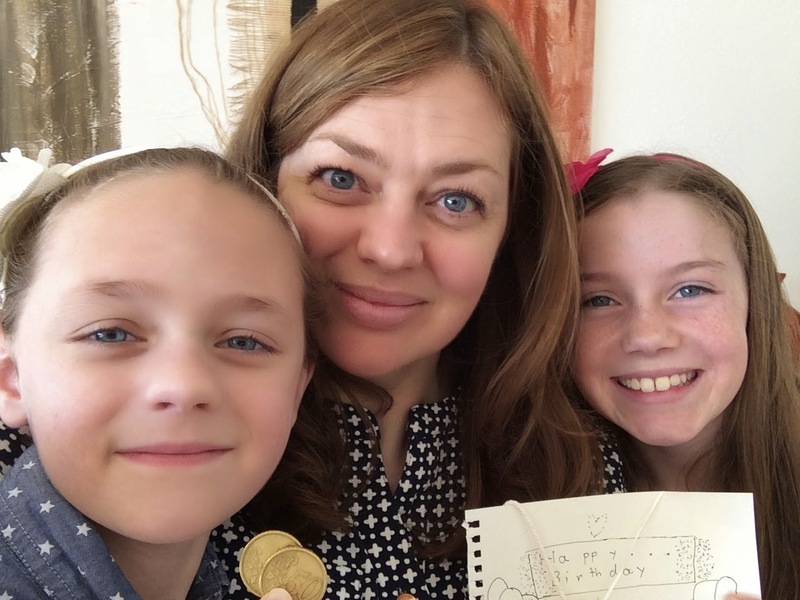 Today I will be talking about my mom's birthday and Valentine's day. It begins where Ellie and I made my mom a birthday gift—one necklace with shells and one necklace with charms. So, since we made her that gift, apparently she had to take a picture with us and the gifts. We went to dinner for her birthday in Perpignan and we had delicious pizza and pasta there. My dad and Joey shared tapas. They looked disgusting. Mom and Ellie posing for a picture, what an exciting event. Here we are toasting mom with our glasses for a happy birthday. This is on Valentine's. It's our family tradition to always get a new book on Valentine's, but since we were in France and all of the books were in French, we got it on our kindles. Unfortunately, we didn't get to eat crepes, which is our other Valentine Day tradition, even though we were in France!!! Here I am, peeking at my book while the others are all posing for another picture. I got a Nancy Drew book!!! Here's Ellie, with her book, Writing Magic, because she wants to be an author. Robbie got some boring book, which he says is Steelheart. Here mom is with her book, which she bought for herself, because, well, she's the mom. It's called All There Is. She hasn't even read it yet. Dad got a book about Paris, called The Greater Journey. And here Joey is, with a book called Crime Travelers. I hope you liked Ainsley's blog post.